Butterflies are a beautiful part of summer. Many species live only for a few hours – just long enough to mate and lay eggs from which will hatch the future generation of butterflies. They are both beneficial insects and sometimes pests in the garden. They serve as pollinators for many plants, but their voracious young can make lace of a cabbage leaf in short order, or chomp down a tomato plant quick as can be. With that said, they are beautiful, and perhaps that is worth a few cabbage leaves or tomato plants. Décor butterflies have the added advantage that they can look beautiful without taking a bite out of the wrong plant. Butterfly wings can be used to create seats. Metal work can create the illusion of delicate wings to serve as the backs of either single chairs or for benches. The openwork of the backs and seats creates comfortable garden seating that allows any small breeze to help with cooling one off. 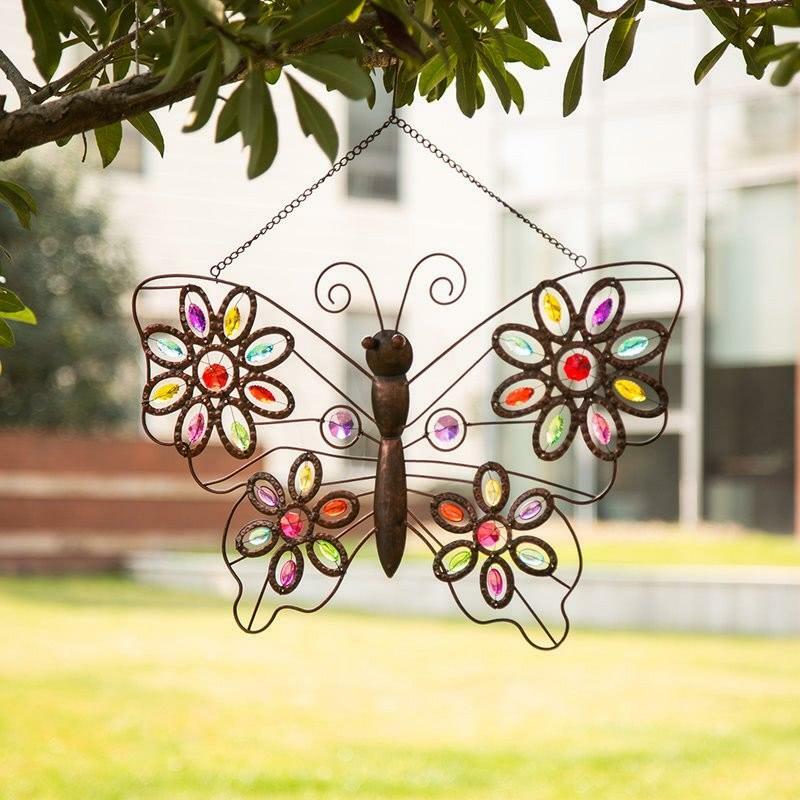 Butterflies created from glass or metal can be hung inside or out (depending on the piece) to capture a little bit of summer for you no matter where you are. Again, sturdy metal can appear delicate, making a butterfly that can hang from a wall, ceiling or tree for many years. Butterfly fountains or lights can enhance the appearance of your patio, flowerbeds, lawn or walk. Fountains decorated with butterflies are reminiscent of butterflies gathering at the edge of a pond or stream. When these charming fountains include a pump and a filter, they can also attract birds to your garden without adding the nuisance of mosquitos. Butterfly lights can provide interest and a small amount of illumination, helping guests or even family members correctly find pathways. Below are several lovely selections of butterfly items, ranging from benches to delicate butterfly mobiles. The items you select will reflect your taste and the places where you need a little bit of spring and summer throughout the entire year. Enjoy looking at these ten lovely butterfly items selected for you. No, it’s not a rock band or even a song, it’s a lovely butterfly outlined in wrought iron and studded with sparkling beads to show the colors of its wings. It is suitable for indoor or outdoor use. Hang it inside for a splash of color, or suspend it from a tree out of doors to enhance the beauty of your garden. Imagine flying away on good flavors or just enjoying the outside ambiance while sitting in a patio chair that has butterfly wings. Gold colored chairs are perfect for a garden party or for a child’s fantasy party. Your guests are sure to be charmed by these ice cream style chairs with the fragile-seeming wings on the back. You can rest from your gardening on this charming white butterfly bench. Openwork tubular seat and butterfly wing shaped back allows the breezes to blow through the bench, helping cool anyone sitting there. Add a bed of flowers love by butterflies nearby and enjoy real butterflies dancing among the blossoms while you rest from working in your garden or from your other labors. Beautiful aluminum butterfly wings wrap a perforated tractor seat style bench. The perforations allow the breeze to flow through the seat and cool off anyone who has paused there to rest. Nest this lovely bench among beds of flowers that attract butterflies and anticipate being able to watch them dipping into the flowers while you rest. Encourage these glass butterflies to cling to your wall all year around. They are resistant to the elements and are suitable for both indoor and outdoor decorating. However, they might need a little protection from wind. The butterflies are executed in subtle shadings of red, green and purple that pick up the colors of spring and summer, keeping them available to you throughout the year. Intended for indoor use, these delicate metal butterflies seem to hover on your wall. Copied from natural species, these butterflies seem to be captured in their most beautiful moment and could be just getting ready to fly off to a nectar-laden flower. They will be like a harbinger of spring that you can keep on hand all year. Display this gorgeous replica tropical butterfly indoors or out as a part of your garden, patio or sunroom décor. You could even tuck it in with your potted plants in your living room or kitchen to give an air of realism. Wherever displayed, it is sure to be a conversation piece. Species of butterfly might vary. The perfect centerpiece for your patio. This darling butterfly table is the base of a small fountain. The water is pumped up from a sunken butterfly shaped pool, then trickles down a series of four leaves, and then returns to the basin. The kit includes one pump and one fountain. Capture the first rays (or last, depending on the orientation of your window) of sunlight with this aethereal butterfly sun catcher. Enjoy the colored sparkles that reflect from it and shower your walls with light. Place it in an east window for a brilliant wakeup, or in a west window for a cheerful good-night to the world. Light your lawn, patio or pool area with a beautiful butterfly solar wall decoration. The lamp is equipped with a solar panel to charge a single rechargeable AAA battery. While the illumination is moderate, it is enough to guide people along a path or around an obstacle. Since it is battery powered, there are no cords to trip over or to tangle and it does not need to be wired in.